San Francisco is known for nature, museums, nightlife, shopping, and childrens museums. 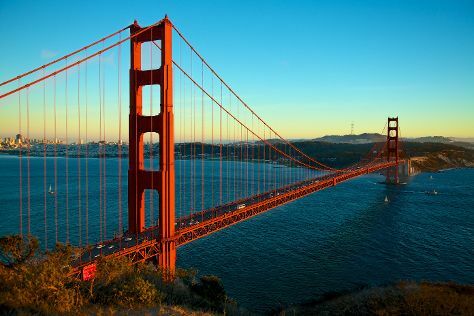 Your plan includes some of its best attractions: snap pictures at Golden Gate Bridge, admire all the interesting features of Twin Peaks, don't miss a visit to Golden Gate Park, and shop like a local with Ferry Building Marketplace. To find more things to do, other places to visit, photos, and more tourist information, go to the San Francisco online trip builder . New York City to San Francisco is an approximately 9-hour combination of bus and flight. You can also fly; or drive. The time zone difference when traveling from New York City to San Francisco is minus 3 hours. In February, San Francisco is a bit warmer than New York City - with highs of 62°F and lows of 48°F. Finish your sightseeing early on the 12th (Wed) to allow enough time to travel to Los Angeles. Change things up with a short trip to Disneyland Park in Anaheim (about 30 minutes away). Pack the 15th (Sat) with family-friendly diversions at Universal Studios Hollywood. The adventure continues: see the interesting displays at The Getty Center, partake in some friendly competition at Fantastic Race, take a leisurely stroll along Santa Monica Pier, and see the sky in a new way at Griffith Observatory. For ratings, more things to do, photos, and tourist information, refer to the Los Angeles day trip planner . Fly from San Francisco to Los Angeles in 4 hours. Alternatively, you can do a combination of train and flight; or drive. When traveling from San Francisco in February, plan for somewhat warmer days in Los Angeles, with highs around 71°F, while nights are about the same with lows around 51°F. You will have some time to spend on the 16th (Sun) before leaving for home.